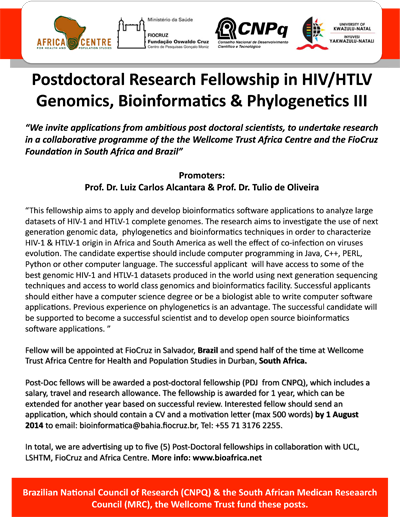 The research aims to investigate the use of next generation genomic data, phylogenetics and bioinformatics techniques in order to characterize HIV-1 & HTLV-1 origin in Africa and South America as well the effect of co-infection on viruses evolution. The candidate expertise should include computer programming in Java, C++, PERL, Python or other computer language. The successful applicant will have access to some of the best genomic HIV-1 and HTLV-1 datasets produced in the world using next generation sequencing techniques and access to world class genomics and bioinformatics facility. Fellow will be appointed at FioCruz in Salvador, Brazil and spend half of the time at Wellcome Trust Africa Centre for Health and Population Studies in Durban, South Africa. Post-Doc fellows will be awarded a post-doctoral fellowship (PDJ from CNPQ), which includes a salary, travel and research allowance. The fellowship is awarded for 1 year, which can be extended for another year based on successful review. Interested fellow should send an application, which should contain a CV and a motivation letter (max 500 words) by 1 August 2014 to email: bioinformatica@bahia.fiocruz.br and xkineri@africacentre.ac.za, Tel: +55 71 3176 2255 (Brazil) and Tel: +27 35 550 7500 (South Africa). In total, we are advertising up to five Post-Doctoral Fellowships. Potential areas of study include population and biological aspects of HIV in the context of the South African epidemic.